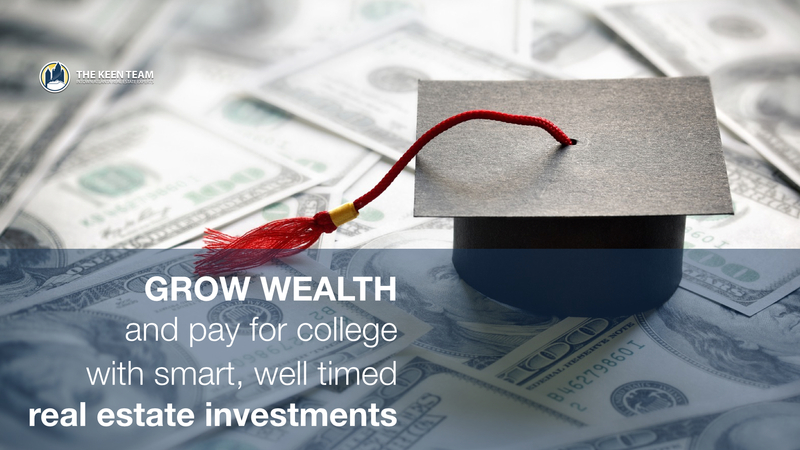 A new trend in real estate investment is emerging: parents investing in real estate to fund their children’s college education. With the ups and downs of the stock market this past decade, more parents are seeking to invest for their children’s future through other assets, including real estate. These parents believe that the time is right to purchase real estate because of low prices and mortgage rates, and have a strong belief that real estate prices will show considerable appreciation by the time their children are in college. The idea is to purchase a house as an investment property when a child is born or very young. Ideally, a 15-year fixed rate mortgage is used for a property that cash flows in the first year. By the time the child has reached college age, the property is paid for and the parents can sell the asset and use the gain to fund college. Not only has the equity in the property grown over 18 years, they’ve benefited from the yearly cash flow as well. Let’s say our fictional parents purchase a $300,000 house with $90,000 (30%) as a down payment. They take out a 15-year mortgage for the balance at 4.5 percent interest. Their mortgage payments are roughly $19,272 for the year (or $1,606 per month). If they rent the house out for $2,400 a month, and have around $700 per month in expenses (taxes @ $300 per month, insurance @ $100 per month, repair escrow @ $200 per month**, and property management @ $100 per month***), they should see about $1,128 in cash per year from rental income for the first 15 years. This estimate also does NOT include interest earned if the parents decide to reinvest cash flow or tax savings when they take depreciation on the property. **Cosmetic and mechanical upgrades are covered by the significant repair escrow. In 18 years the property will have appreciated, too. The standard rate of appreciation for real estate nationally over the past 40 years has been 3 percent. If we assume a conservative rate of just 2 percent, this $300,000 property would be worth $428,470. The initial $90,000 investment results in combined cash and property assets valued at $506,590 over 18 years. That equates to a solid 10.08% yearly rate of return on the initial $90,000 investment. Plus, the parents now own a real property asset conservatively valued at $428,470. They can time the market and sell for the highest possible return, or they can continue to hold the property for the $1,700+ per month passive income stream. While it's difficult to determine what future tuition will be — increases in tuition have spiked dramatically in recent years — a $230,000 ($170,000 sales price + $60,000 in cash flow) cushion should be enough to soften the tuition blow. Investors aren’t limited to purchasing real estate to fund college, either. Many choose to purchase property during the college years to provide their children with a home and save on room and board. In a recent survey of real estate agents, 64 percent saw a significant number of parents investing in college-town real estate for their children. With the increase in room and board and the high demand for rental property in college towns, the strategy makes sense. Atlanta-based parents Katie and Dale have even purchased a house with multiple bedrooms for their children, leasing the spare bedrooms to other students. Because of the high demand, the rent helps pay the mortgage on the property, and the parents plan to sell when their children no longer need the house. In the long run, these savvy parents are saving money and helping to provide their children with a stable place to live during their college careers.